In this lesson, we’re going to look at how to use hot asset reloading in a react_on_rails app with Hot Module Replacement. Hot reloading means automatically showing live code changes in the browser without having to reload the page every time you change something. It’s quite useful in development. You can have your code and browser windows next to each other and simply write code and save it, and see the changes immediately without switching over to the browser or refreshing it. The react_on_rails gem uses a special type of hot reloading called Hot Module Replacement or HMR via Webpack Dev server to provide the hot assets to Rails, rather than the asset pipeline. When you start the app, Webpack builds the bundle and then continues to watch the source files for changes. If it detects a source file change, it rebuilds only the changed module(s) and updates them in the browser through an HMR runtime. The react_on_rails gem has a README on how to set this up. But the example code they provide has a lot of extra bits and it’s easy to get lost in npm hell trying to do all of that at once. I recommend you clone the react_on_rails repo anyway on your computer and look in the spec/dummy directory for the hot reloading setup code example. You have to change a number of files and settings, so I’m going to take you through the setup step by step. Hot reloading is only meant for development, so we need to produce two sets of config files — one for development to use hot reloading and one for production (to use static assets). Let’s first do the setup for hot reloading and we’ll add the extra setup for serving static files in production, later. The two key packages are react-transform-hmr (which enables reloading through a hot module replacement API) and webpack-dev-server (the development server that serves the live assets). In addition, we need a babel plugin for applying the transform as well. We’re also going to add jquery and jquery-ujs here so that they are bundled by webpack (instead of Rails) and made available to any other packages that depends on them. And that’s the packages done. 2. Next, let’s set up the webpack config files. We need a base config which will be shared by the hot config and the static one. I’ve copied these config files from the react_on_rails repo spec/dummy/client directory into my app and simplified them to just use the basics that we need. The base config mainly sets up the entry points and file extensions to be resolved. It leaves the output setting for the environment-specific config files. It also exposes jQuery as a global so that it’s available to any other packages dependent on it. Now let’s look at the hot config. It builds on top of the base config. It pulls in the basic config and adds some extra things for hot reloading. It sets the port where webpack dev server will run (3500). It adds a couple of entry points — the first is the live asset from webpack dev server and the second is a module it needs. Then it sets the output filename and path. We’re just calling it webpack-bundle. If you look in the react_on_rails repo example, they split it into two files — one for the app and one for vendor files. But we’re keeping it simple here and just creating one output file. The most important bit here is this loader which takes our jsx files and applies the hmr transform through a babel plugin. And then we add the hmr plugin to the config and export it. 3. The next step is to include the correct webpack assets file for each environment in our Rails application layout file, based on whether we’re using hot reloading or not. We’ll use a view helper to configure the correct assets to load — either the “hot” assets or the “static” assets depending on the environment. We have two tags here, one to load the hot assets which don’t use turbolinks and another for static assets. And then we need to create these two files. We require the webpack-bundle first and then require application_non_webpack. react_on_rails uses this bit of code to require turbolinks based on an env variable. We can use it to easily disable or enable turbolinks. Ok so that’s all set up. Now if we want to use static assets then we’ll include just the application_static file which includes webpack_bundle and any non webpack assets. And if we’re using hot reloading then we’ll include the hot assets from webpack dev server and the non webpack assets like turbolinks from application_non_webpack. 4. 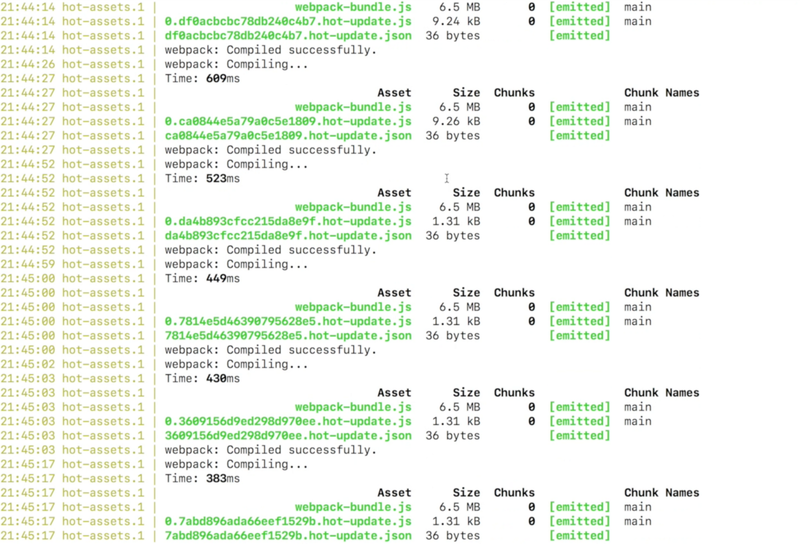 Next we need to make sure that we include the webpack generated files in our assets initializer config file. type = ENV["REACT_ON_RAILS_ENV"] == "HOT" ? "non_webpack" : "static"
So again here, based on this env variable we set the name of the file to include in our precompiled assets. 5. Next, we need to create a new Procfile for hot reloading. We’ll call it Procfile.hot. Remember, it goes in the root of the app directory. First the rails server — it runs it with the REACT_ON_RAILS_ENV variable set to HOT. Second, hot-assets which is a script for serving the hot assets on port 3500 via webpack dev server. So that’s Procfile.hot all done. 6. We need to add the server-rails-hot.js script for running the webpack dev server to our client directory. This file imports webpack, webpackdevserver and our hot config and then creates a new dev server and runs it on port 3500. This file needs to be used by an npm script. And that’s the last missing piece of the puzzle. First, let’s do the package in the root directory. "hot-assets": "(cd client && npm run hot-assets)"
The build:dev:client script is for static assets which we’ll look at in a minute. But the hot-assets one is what we need for hot reloading. It cd’s into the client directory and npm runs another script called hot-assets. So here you can see the hot-assets script runs babel-node (a command line tool provided by babel) with our server-rails-hot.js file that we set up earlier. So let’s see it in action now! and our bundle gets compiled successfully. Now let’s test our app in the browser. To test hot reloading, I’m going to place my code editor next to the browser and you’ll see the live changes I make automatically appear in the browser. If we look at the logs, we’ll see that webpack dev server is serving these hot updates. Look at the size of the update files. They are a few bytes. So this is quite fast. Alright, so that’s hot reloading set up for development. 8. Now one final thing is to set up the config for serving static assets to use in production or if we don’t want to use live reloading in development. We need a couple of things — a static webpack config and a static Procfile. // Note that Foreman (Procfile.dev) has also been configured to take care of this. I’ve used the webpack.client.rails.build.config.js file from the react_on_rails spec/dummy example and simplified it to only include the bits we need. Similar to the hot webpack config, it builds upon the base config. It sets the output filename and adds the loaders we need. # Run Rails without hot reloading (static assets). # Build client assets, watching for changes. # Build server assets, watching for changes. Remove if not server rendering. We need the top two processes, one for rails and the other for serving the assets. The last process is for server rendering, which I’ve commented out. It runs webpack with the build config file we just created. Ok, so that’s the setup for production. We’ll no longer get the webpack dev server message in the logs and we’ll just have the rails app running on port 5000. Now if we make a change in a component, it won’t appear automatically in the browser. We’ll need to reload the page manually to see the change.